Indian Beaded Link Silver Mesh Belt | BUDK.com - Knives & Swords At The Lowest Prices! 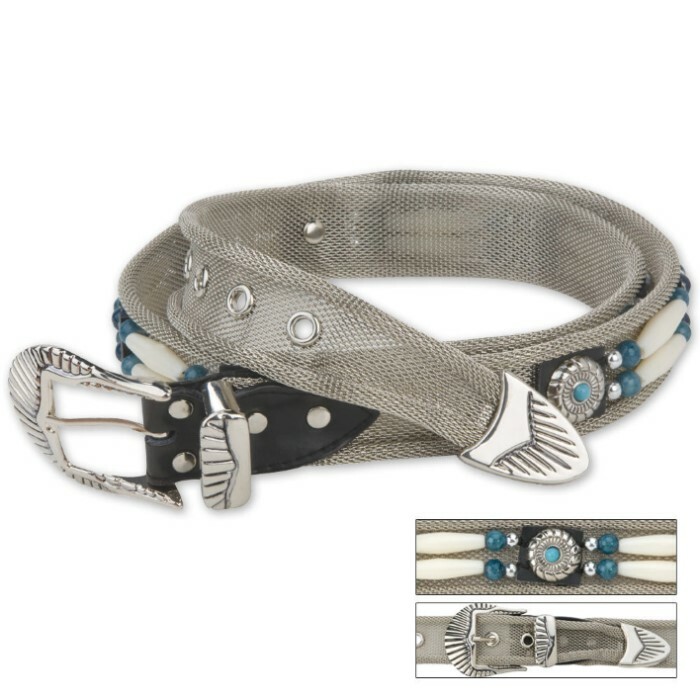 This stylish Native American belt is the perfect accent to your western attire. I RECEIVED THIS BELT AS A GIFT FOR CHRISTMAS MY YOUNGER SISTER SAW IT ON ME AND ALMOST TOOK THE BELT OFF OF ME; SHE LOVED IT SO MUCH!! WELL I HAD TO PURCHASE THE SAME BELT FOR HER. SHE IS GOING TO BE THRILLED. THE WORKMANSHIP ON THIS BELT IS IMPECCABLE!! IT IS JUST AN AWESOME BELT. AND IT IS TRUE TO SIZE. THERE IS NO ADJUSTMENTS TO BE MADE. SHE WILL NOT BE DISAPPOINTED IN THIS BELT. I WILL RECOMMEND THIS BELT TO ALL MY FRIENDS!